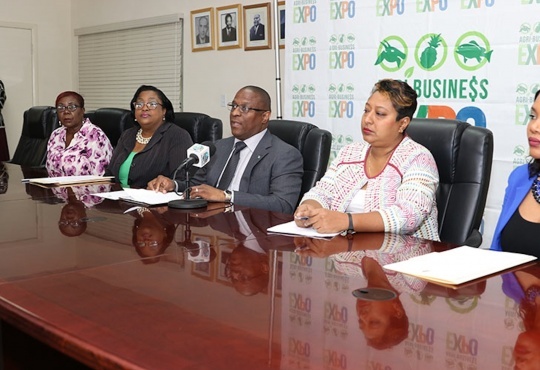 NASSAU, The Bahamas — The Ministry of Agriculture and Marine Resources held a press conference Tuesday, April 9, at the Ministry’s offices to announce its Bahamas National Agri-Bahamas Expo for 2019 at the Gladstone Road Agricultural site Thursday, May 9, thru Saturday, May 11. Minister of Agriculture and Marine Resources the Hon. Michael Pintard said the shorter title, ‘Expo 2019,’ will be used; and this year’s theme is “Embracing change, improving lives through agriculture.” The theme is reflective of the mission in Agriculture, which is to use the natural resources of land and sea to empower the Bahamian people. The intent of Expo 2019 is to expose the nation’s farmers, artisans, craftsmen, processors, agri and marine business people to the consuming public, as well as provide opportunities to learn, enhance and grow their approaches to their business.